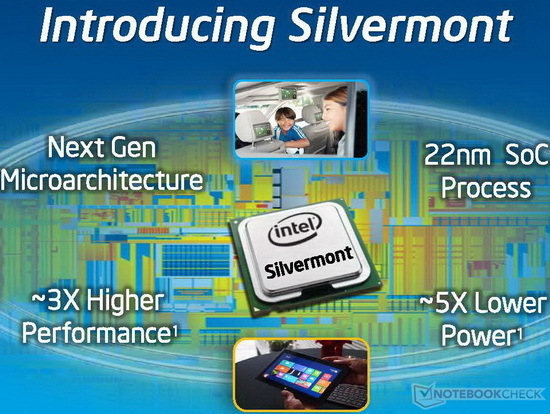 The Intel Atom Z3745 is a power efficient quad-core SoC for Windows and Android tablets. It is clocked at 1.33 - 1.86 GHz and part of the Bay Trail-T platform. Thanks to the specially optimized 22 nanometer low-power process (P1271) with tri-gate transistors, performance and energy efficiency have been significantly improved compared to its predecessor. Compared to the Z3740, the Z3745 is based on the new C0 stepping and offers a slightly increased GPU clock rate. Thanks to 4 CPU cores and the improved performance per clock, the Z3745 is significantly faster than previous Intel Atoms, e.g. the Z2760. Depending on the benchmark, the Z3745 competes with Temash and Kabini APUs like the AMD A6-1450 and A4-5000. For everyday tasks such as Internet or Office the performance is adequate, but not for very complex software or modern games. The HD Graphics (Bay Trail) is based on the Intel Gen7 architecture, which supports DirectX 11 and is also found in the Ivy Bridge series (e.g. HD Graphics 4000). With only 4 EUs (Execution Units) and a relatively low clock speed of up to 778 MHz, the GPU is even slower than the HD Graphics (Ivy Bridge). Therefore, only older and less demanding Windows games like World of Warcraft or Fifa will run fluently. However, video acceleration and display resolutions up to 2560 x 1600 pixels are no problem for the chip. The Intel Atom Z3736G is a power-efficient quad-core SoC for tablets (Android or Windows). It is clocked at 1.33 - 2.16 GHz and part of the Bay Trail-T platform. Thanks to the specially optimized 22nm low-power design process (P1271) with Tri-Gate transistors, performance and energy efficiency have been significantly improved compared to its predecessor. In contrast to the Z3736F, the Z3736G only offers a 32 bit single-channel DDR3L-RS-1333 memory controller (max. 1 GB, 5.3 GB/s). Thanks to 4 CPU cores and the improved performance per clock, the Z3736G is significantly faster than previous Intel Atoms like the Z2760. Depending on the benchmark, the Z3736G competes with AMDs Kabini APU A4-5000. For everyday tasks such as Internet or Office the performance is adequate, but not for very complex Windows software or modern games. Compared to ARM SoCs for Android systems, the Z3736G is placed in the upper mid-range segment.